Denim Style Ladies Shirt Size 10. Condition is Used. Dispatched with Royal Mail 2nd Class. Size Medium Denim Off The Shoulder Top. Condition is Used. Dispatched with Royal Mail 2nd Class. 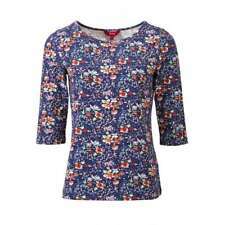 Gerry Weber Casual Top Blue Multi 12. Condition is Used. Dispatched with Royal Mail 2nd Class. Boat type neck, three quarter sleeves. Pit to pit 19 inches, length 24. Ladies Superdry navy blue/white strip/gold star 3/4 sleeve loose fit top size M. Condition is Used. 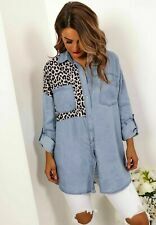 Denim Shirt Top Dress Size 10 New Look. Condition is Used. Dispatched with Royal Mail 2nd Class. Toast T Shirt Cream Marl/Blue Stripe 3/4 Sleeves Pleat Front Size M. Condition is Used. Dispatched with Royal Mail 2nd Class. Zipped to back. Lovely quality denim top from Whistles in excellent condition. Atmosphere Navy and White Stripe Top. Size 12. 95% Cotton, 5% Elastane Paypal only please. Fatface Blue Denim Colour 100% cotton button fronted Top Size 8 In fairly good clean used condition with some natural wear to the cotton and photo 11 indicates a small fray as well to the back of the neck. Sleeves have a button back feature. The sizing is deceptive as the chest measures 19 inches across from underarm to underarm laid flat and that would usually fit a size 14 but looking at it that’s not the case- however it will fit size 10 as well as an 8. Length from shoulder to bottom hem is 24 inches and 25 inches at the back. Smoke free home. Tu Tunic Top, Denim Blue Size 18. blue denim colour with small Floral design Buttons down front V- neck Ruched design on front Condition is Used. Dispatched with Royal Mail 2nd Class. Excellent condition From smoke free house Please check out other tops I have for sale. Will look at combining postage for multiple items if I can work out how!! Moda By George Dark Blue Denim Tunic Size 16. ruched panel to front, tie at back Condition is Used. Dispatched with Royal Mail 2nd Class. Excellent condition From smoke free house Please check out other tops I have for sale. Will look at combining postage for multiple items if I can work out how! !